It’s not unusual to suffer with self esteem issues; in fact it is quite a common problem. However, not loving yourself can be highly destructive and can definitely stop you achieving your goals. So whether you want to attract that promotion, light up a room when you walk into it or you want to attract positive situations and people, one really important step is to learn to love yourself. When you can recognise your merits and believe that you are lovable, regardless of whether or not you are in a relationship and regardless of your successes this month, this year or last; then you feel worthy of being loved, of being happy and of your dreams becoming a reality. When you learn to love yourself, you suddenly feel good enough, attractive enough, and successful without the approval of others and you’re happiness and confidence comes from within and is not dependent upon anyone or anything else. So, why do we find it so difficult to love ourselves? Well, part of it is to do with a completely natural brain function called Negative Bias. Essentially negative bias means that our brains have a tendency to focus on the negative things in our life rather than those things that are neutral or pleasant. The negative bias is also referred to as the negativity effect. If you find yourself dwelling on bad experiences, traumatic events, negative things or just focusing on bad things then this is the negative bias. Researchers have concluded the negative bias is a survival mechanism that helped us to survive in our early existence: as having the ability to quickly recognise something negative could be the thing that saves your life. Research shows that negative stimuli produce more neural activity than positive stimuli and not only this, but they are also perceived with greater ease and speed. For example, people in studies can identify angry or aggressive faces faster than happy ones. Interestingly, even if they are shown these images so quickly that it is not possible for them to have any conscious recognition of them, the ancient fight-or-flight limbic system of the brain is still triggered by the sight of aggressive faces. Indeed the alarm bell of your brain — the amygdala uses around two-thirds of its neurons to look for negative scenarios; in other words it’s primed to go negative. Once it sounds the alarm, negative events and experiences get quickly stored in memory — and these negative memories are not stored in the head, but in the body. If you want to read more about how emotions are stored in the cellular memory then I recommend reading ‘Molecules of Emotion’, by the late Dr. Candace Pert. Our negativity bias is so much a part of our psyche that we often don’t even register it and we don’t hear ourselves reciting negative thoughts such as, I’m stupid, worthless, ugly, too fat, too thin…and yet that voice is relentless and these negative thoughts about ourselves become mantra like and in turn make it difficult for us to love ourselves or even allow other to love us. Our upbringing and social conditioning from a young age can also cause us to harbor negative thoughts about ourselves. We may be told as a child that we are ‘too loud’ for example, and this may cause us to feel self-conscious when talking, or you may have been called ‘stupid’ and this comment has been absorbed and stored and when all of this is added to all the media images of success that we are exposed to each day it is easy to fall into a negative cycle of feeling inadequate or worthless. Through media we are constantly fed an image of what success looks like: the type of life that successful people have, what cars they drive, what house they live in, what watch or clothes they wear, where they eat out and even what their personal relationships are like. Advertisers and the media make us feel unsuccessful if we aren’t wearing the right clothes, driving the right car or living in the right postcode. We end up comparing ourselves to the ideal, an ideal that isn’t even real. I bet that even if we managed to get everything that is deemed “successful” and got all the trappings of a successful life we would still find fault and then we would focus on that negative rather than on the positives. Making comparisons to others and feeling like a failure is just another symptom of our inner negativity and a way of denying ourselves self love. No matter how we hold ourselves back, the truth is that most of us fall into the “not loving ourselves” trap, which means that we miss out on so many benefits that come with loving ourselves and end up living in a continuous negative cycle. Positivity attracts positive things – when you love yourself, you feel better about yourself and have more self-confidence, which carries over to all aspects of your life – your relationships, your work, and your personal life. The positivity improves all parts of your life including attracting positive opportunities and situations. When you live in a state of unconditional love, coming from your heart, it will not only fill you with self-love but also radiates out to others and can improve relationships. Loving yourself ‘warts and all’ means that you accept and love yourself when you are angry, sad, scared, unreliable, having a bad hair day or at a low ebb. You may still decide to do some self-improvement or to make changes to your life, but you’ll be doing it from a place of love rather than from a negative place of self judgment. Exercising self love means that you recognise and accept your positives, the unique gifts you have, your strengths, skills, and talents, rather than feeling unworthy of these gifts or not even recognising them. You accept the natural flow of life and accept that there will be good days and bad days — and that these are part of life – and are no reflection of you. You have the inner strength and confidence to deal with adversity with clarity instead of just jumping into self hate and leaping into the self blame game. You will have better health and well-being. 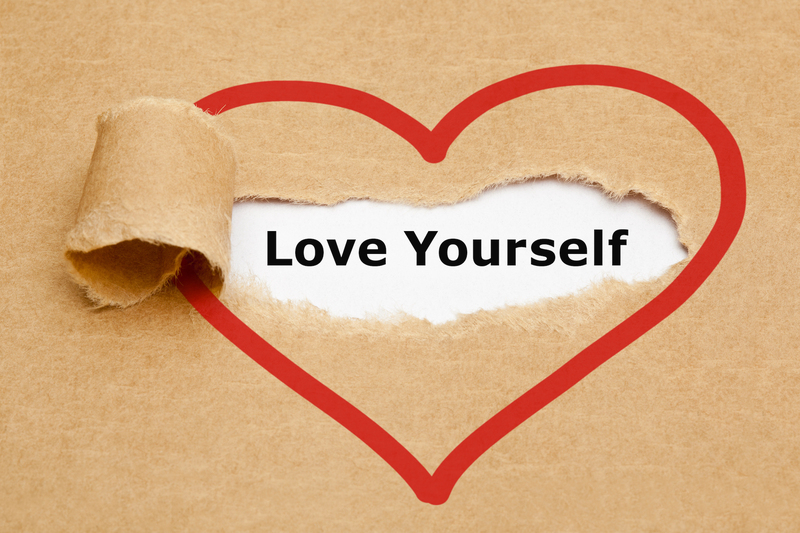 Self-love reduces stress, depression, cardiovascular conditions, and autoimmune diseases. Self love will help you let go of a lot of negative emotions like guilt, shame, failure, and negative body image. Self-love gives you the confidence and courage to live life to its full potential. You stop competing with others and comparing you and other negatively, instead you learn to accept what is and don’t need to put yourself or other down. You start being more grateful for the good things in your life. Our life will become more blissful as the inner love will bubble out and you’ll find yourself returning to your natural state, which is one of peacefulness, happiness and smiles. We are designed to be happy and blissful and self love is one of the keys to achieving this natural state. Loving yourself is a mindset and it takes practice. It’s waking up every day knowing that you are lovable exactly as you are, perfectly imperfect and making changes to improve your life based on a position of love. Self love means that you can begin truly living your life, rather than just going through the motions because you don’t feel that you deserve to live a blissful life. The first step to achieving self-love is to start being mindful and practice thinking positively about yourself, you may want to consider an emotional detox to deal with the root cause of your negativity and to release toxicity and energise your life with joy. To learn more about Emotional Detox and how you can benefit, please click here.